Brighter – Committing to a sustainable urban future in the Tropics. 31 July 2017. Article about JCU’s participation in the Habitat-UNI. Brighter – Built for comfort: Exploring how microclimates impact the economy. 25 July 2017. Interview about the ‘Economic Benefits of Urban Comfort’ research project. Courier Mail – Scientist seeks to help make Cairns’ urban spaces more attractive to locals and tourists. 2 August 2017, Brisbane, Australia. Article about the project ‘Economic benefits of Urban Comfort’, more on the project here. Cairns Post – City bid to make best use of space: Urban design specialists help council with options. 2 August 2017, Cairns, Australia. Article about the project ‘Economic benefits of Urban Comfort’, more on the project here. The Record – Landscape students to revamp preschool. 3 August 2016, Selwyn, New Zealand. Article about the Site Design course project at Lincoln University (LASC 216). The Record – Turning up the heat on climate change. 19 June 2016, Selwyn, New Zealand. 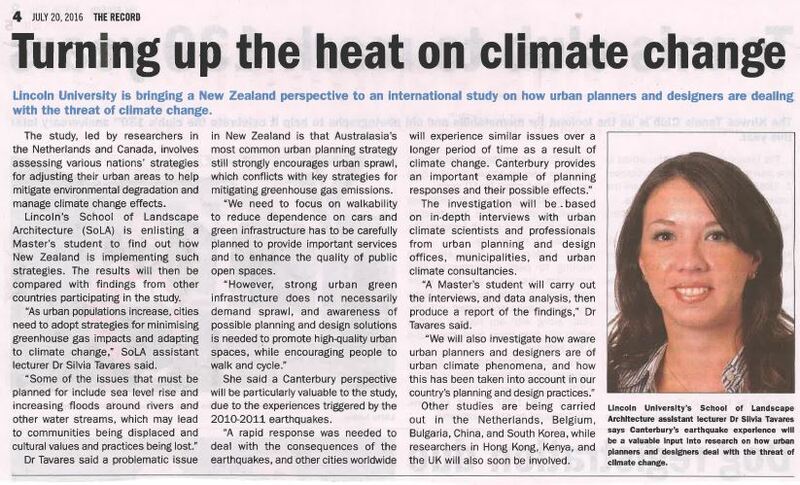 Article about the Urban Climate Adaptation International Study of which Lincoln University has become part of. The Press – The case for cultural connection in city. 29 April 2015, Christchurch, New Zealand. Article about the need for considering local culture to achieve urban comfort in post-earthquake Christchurch, based upon evidence from my doctorate research. Land8 – Comparing and Contrasting Landscape Architecture in Brazil and New Zealand. 8 July 2014,. Differences on the profession in a country where it is part of Architecture and Urban Design degree (Brazil) and another where it is an independent degree (NZ). Abode Magazine – Four seasons in one day: creating a liveable city through microclimate design. July/August 2014, Christchurch, New Zealand. (Also published as a Lincoln University Media Release, 17 April, 2014) – Opinion piece about microclimate design considerations on the rebuild of Christchurch Central City. Mindfood – Changing the future. June 2016, New Zealand – Interview about future changes in urban living. Conselho Brasileiro de Lideranças em Placemaking – Placemaking, urbanismo e o futuro dos espaços públicos. 3 April, 2015 (In Portuguese). English version here. The SoLA Blog – Second year students visit preschool. 18 July 2016. Pelotas 13 Horas – Silvia Tavares relata experiências na Nova Zelândia. 05 April, 2013, Pelotas, Brazil (In Portuguese) – Radio live conversation about my experience of living in New Zealand, including perspectives about the Country’s economy, politics, education and recent earthquakes.